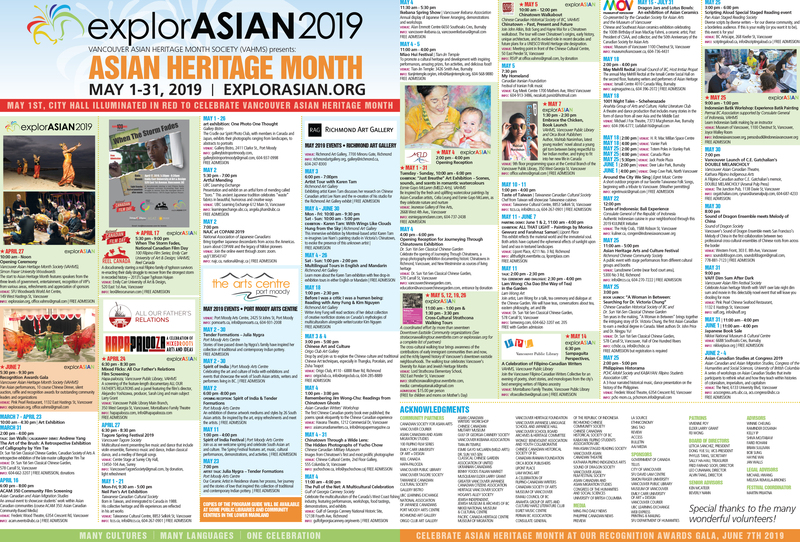 explorASIAN – a monthlong series of events celebrating Asian Heritage Month in May – launches Saturday, April 27 with a ceremony at SFU’s Djavad Mowafaghian World Art Centre. Guests at the opening ceremony will include Wade Grant of the Musqueam Indian Band, Minister of State for Trade George Chow, Vancouver City Councillor Rebecca Bligh, and MP Hedy Fry. Balinese gamelan and Thai dance performances are featured in the programme. The festival, one of the longest-running in Metro Vancouver, promotes the contributions of Canadians of Asian heritage to Canada’s growth and prosperity, says organizer Leticia Sanchez, president of the Vancouver Asian Heritage Month Society (VAHMS), which is celebrating its 23rd anniversary this year. Event highlights include a guided cross-cultural walking tour of Vancouver’s downtown eastside neighbourhoods that will explore the contributions of early immigrants who settled in Hogan’s Alley, Jewish Strathcona, Japantown (now Powell Street) and Chinatown. The tours, to be held every Sunday in May, celebrate Canada’s Asian Heritage Month and Jewish Heritage Month, which both fall in May. “Art in its many forms, from some of them most creative Canadians of Asian heritage, plays a central role in explorASIAN,” said Sanchez. A key attraction in the lineup this year is a unique collaboration between the Sound of Dragon Ensemble—famed for pairing Chinese and western instruments—and premier San Francisco-based Chinese chamber group Melody of China, which will be held May 30 at the Western Front in Vancouver. Other live performances include Indian classical dance and flamenco music, scheduled on April 27 at Surrey City Hall; Iranian folk music, on May 5 at the Kay Meek Centre in West Vancouver, and a theatre production of the 1,001 Night Tales – Scheherazade, scheduled on May 18 at the Michael J. Fox Theatre in Burnaby. For film fans, explorASIAN offers When The Storm Fades, a documentary-comedy about the Filipino survivors of a devastating typhoon, showing April 17 at Emily Carr University of Art + Design, and All Our Father’s Relations, a feature film on the Grant family’s journey of discovery from Vancouver to China, which screens April 24 at the Vancouver Public Library, Central Branch. Art, ceramics, photography, calligraphy and other exhibitions and demonstrations are also slated across the metro, and most activities are free and publicly accessible. The festival opens with Vancouver City Hall illuminated in red on May 1, to celebrate the starting day of Asian Heritage Month. It concludes with a special gala on June 7 that will recognize outstanding community leaders and organizations who have significantly contributed to Asian cultural diversity and explorations in Vancouver and beyond. MEDIA: Click here (dropbox: https://bit.ly/2VsJolS) to download images.